TORONTO, April 14, 2015 – Cundari has launched Kickstopper.ca, a not-for-profit online platform where grassroots charities can crowdsource donations to help raise funds to stop injustices and impact positive change. The website is geared toward small, grassroots charities who may not otherwise have the means or platform to generate awareness of their causes. Charities with registered projects on the website include Engage and Change, Homes of Joy, Home Suite Hope, KidSport and Operation Come Home. Kickstopper.ca invites more charities to register at kickstopper.ca. Kickstopper.ca does not take any portion of donations – it is completely not-for-profit. Aside from a small administration fee for using the payment provider, funds raised go directly to the selected charity. Moreover, contributions on Kickstopper.ca are processed regardless of whether or not the charity reaches its donation goal – a huge benefit. The power of choice is another key benefit for people considering donating. Not only can individuals select the charity they are interested in contributing to, but different levels of donation means they can choose how much they want to donate, in addition to seeing the direct output of their contribution. For instance, a $35.00 donation to Project Water will provide two Summer Essentials Packs, including sunscreen, lip balm, a T-shirt and a baseball cap. The takeaway? Even small donations can add up to big change. Canadians interested in donating can visit the website at kickstopper.ca to review and select their preferred charitable project. Each project breaks down exactly how much can be achieved at each level of donation. Visitors are free to donate any amount that they wish. Registered charitable organizations can create projects on the website at kickstopper.ca. Once a project is submitted, it will be reviewed and validated by a member of the Kickstopper team. Once validated, the project will appear on the website and donations can be processed. To ensure that each charity has a good chance at reaching its goal, there may be a limited number of charities featured on the website at any given time. 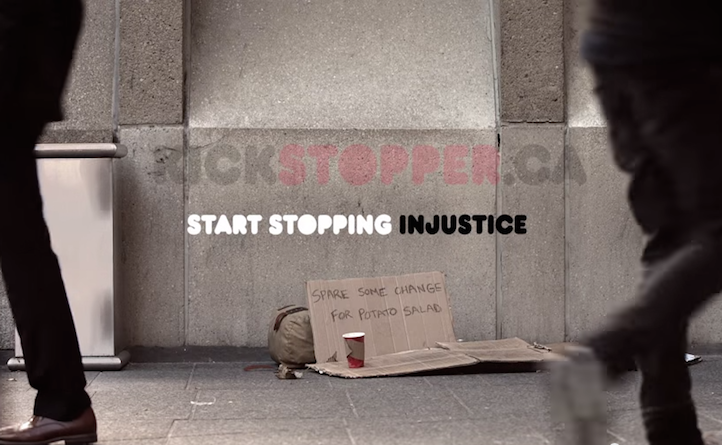 While many societal problems can seem insurmountable, Kickstopper is inspiring Canadians to take action and stop suffering, stop inequality and stop believing they cannot make a difference. Kickstopper.ca is a not-for-profit online platform where grassroots charities can crowdsource donations. By donating, Canadians are helping to raise necessary funds to stop injustices and make a difference in the lives of those who need it most. For more information, visit kickstopper.ca. Cundari is Canada’s most globally awarded independent agency. The agency has been recognized around the world at Cannes, the Cassies, by the UK’s Directory Ranking and is the only Canadian agency to have two campaigns on WARC’s 100 smartest marketing campaigns in the world list. Cundari, with offices in Toronto and Montréal, works in our two official languages across an array of disciplines such as research, strategic planning, brand identity, advertising, design, digital, experiential, direct and media planning and buying. Established in 1980, Cundari Group Ltd. is proud to have been entrusted with premier brands including CIBC, BMW, LCBO, Dempster’s, Maple Leaf Foods, Royal Canin, Fix Auto and Primus. For more information, visit cundari.com.